Against the backdrop of many original features, these homeowners were playful with color in their tidy bungalow kitchen. 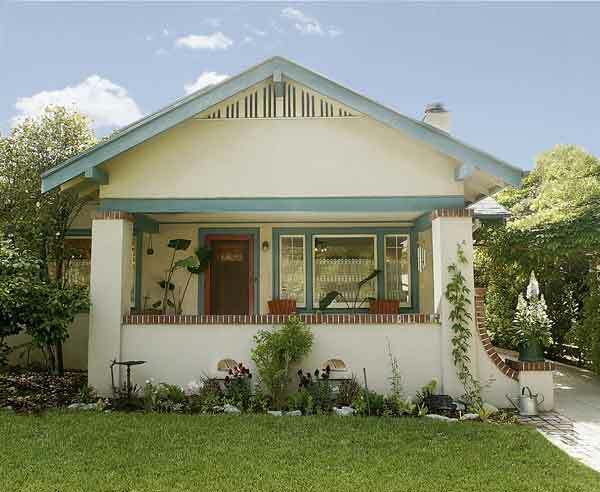 Practical yet old-fashioned, straightforward yet edgy with color, this Pasadena kitchen is a perfect fit in a 1922 bungalow. 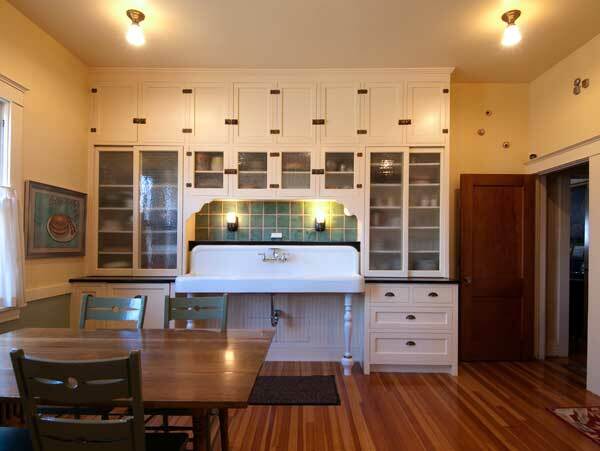 If this kitchen looks perfect for the 1922 bungalow, that’s because it was inspired by the original one. “We loved our kitchen even before the restoration,” says Kristy Clougherty, who, with husband Brian, has owned this house since 2001. 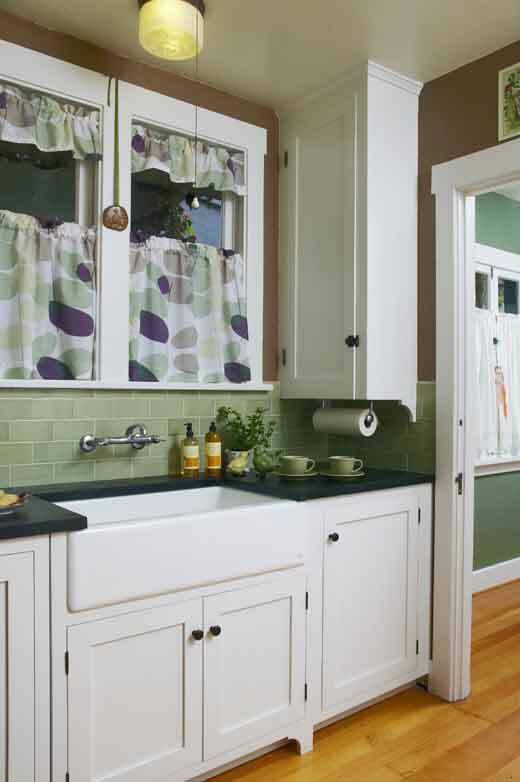 Set off by dark soapstone, plain white cabinets were matched to the old ones, but with a flared-leg detail added. (The original owner-builder was from back East, where soapstone was more prevalent.) The kitchen faucet is still wall-mounted, “against advice,” says Kristy, “but it works and is just like the original.” A new dishwasher hides behind a door. 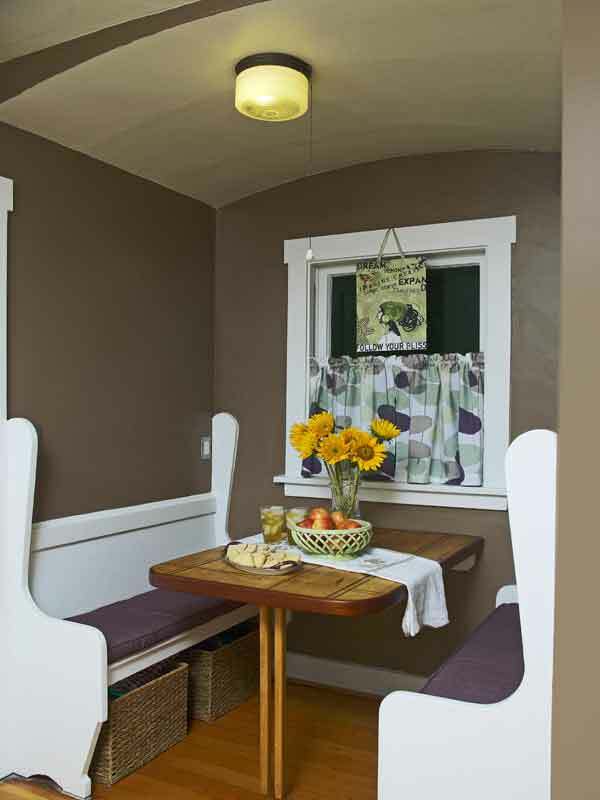 A period convention very popular in today’s revival, the breakfast nook is a bungalow basic. This one is an original; benches echo the curved ceiling. 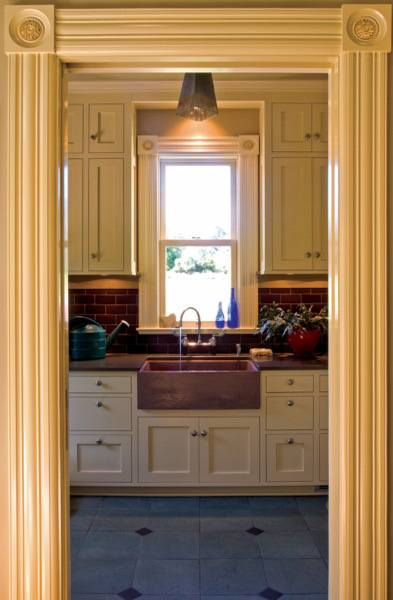 Bold chocolate walls soften the high contrast between cabinets and countertops. The soapstone’s sage-green veining is picked up in a new backsplash of porcelain subway tiles. For fabrics, Kristy was looking for something unexpected to complement the rich brown of the table in the nook. “Oddly enough, it’s my dad who sews—usually industrial fabrics for nautical purposes. He whipped up the café curtains and the nook’s seat cushions, piping included—very professional!” Kristy boasts. 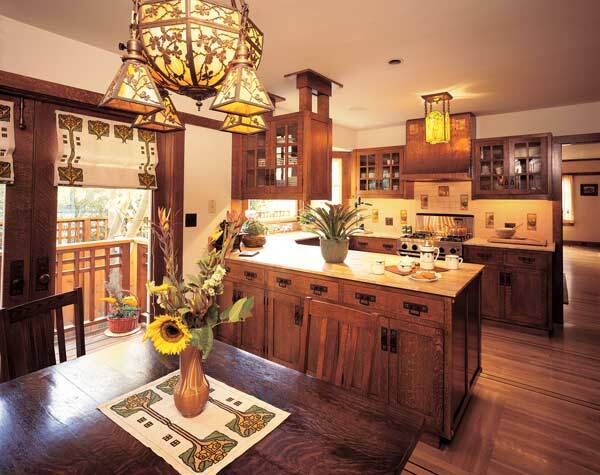 A Victorian house gets a sunlit kitchen with period details.